June 15, 1907 – William LeBaron Jenney dies at 7:00 a.m. in Los Angeles, California at the age of 74. Although still a partner in the firm of Jenney, Mundie and Jensen, he has not been active in design work for two years. Jenney was born in Fairhaven, Massachusetts in 1832 and at the age of 26 entered the Ecole des Arts et Manufactures in Paris after earning a degree from the Massachusetts Institute of Technology. The Civil War called him back to the United States where after a time in the Union Army he was made the Chief Engineer of the Fifteenth Army Corp, supporting the rapid movements of General Sherman’s and, later, General Logan’s advance, a role that required the design of bridges built strongly and in a hurry. Out of uniform, Jenney came to Chicago in May of 1868. 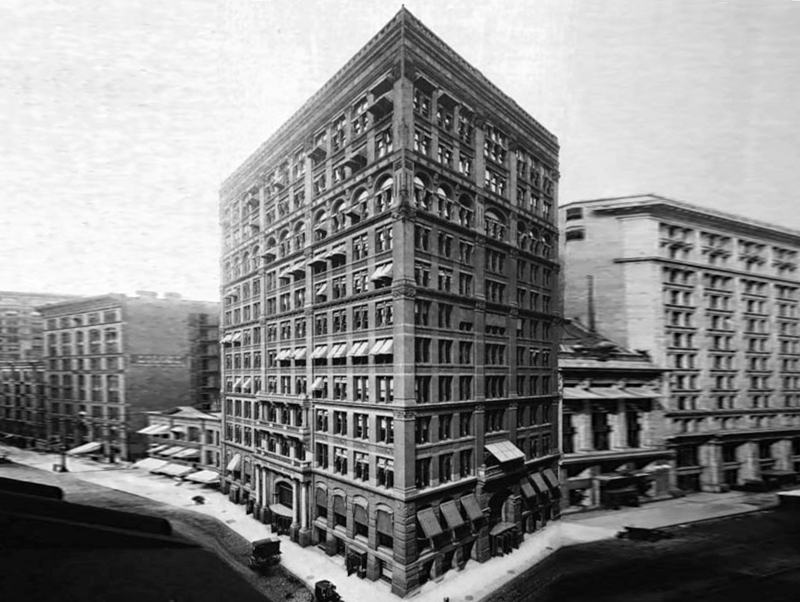 Fifteen years later Jenney made a name for himself that would last as long as a tall building moves from concept to construction when he designed the Home Insurance Building on the northeast corner of Adams and LaSalle Streets. The Chicago Daily Tribune in his obituary states, “It was in 1883 that Mr. Jenney was appointed architect for the Home Insurance company of New York, with instructions to prepare designs for a tall-fireproof office building … The order further called for a maximum number of well lighted small offices above the second story which, as Mr. Jenney knew, would necessitate small piers – smaller probably than were admissible if of ordinary masonry construction … Architects had before been obliged to inclose an iron column within a masonry pier, and the greater use of this idea, together with another -- making each story a unit in itself – marked the solution of the problem. Thus the Home Insurance building, designed by Mr. Jenney, was not only the first of the steel construction buildings of the world but it opened the way for a long list of requirements in fine office buildings, such as wind bracing, thorough fire proofing, rapid safe elevators, light and well ventilated rooms, modern plumbing and tile vaults.” [Chicago Daily Tribune, June 16, 1907] The Home Insurance Building is shown in the above photograph. June 15, 1931 – The American Institute of Steel Construction selects the new Wabash Avenue Bridge as the most beautiful span costing more than one million dollars constructed in the United States or Canada during 1930. The jury observes that the bridge over the Chicago River was “a most pleasing solution of a most difficult bridge design problem.” [Chicago Tribune, June 16, 1931] City Bridge Engineer Thomas G. Pihfeldt drew the plans for the bridge, which was fabricated by the Ketler Elliott Company and cost $1,750,000 to build. Because the bridge is adjacent to a bend in the river, the government refused to allow the pits for the counterweight and trunnion to intrude on the river beyond the dock lines. 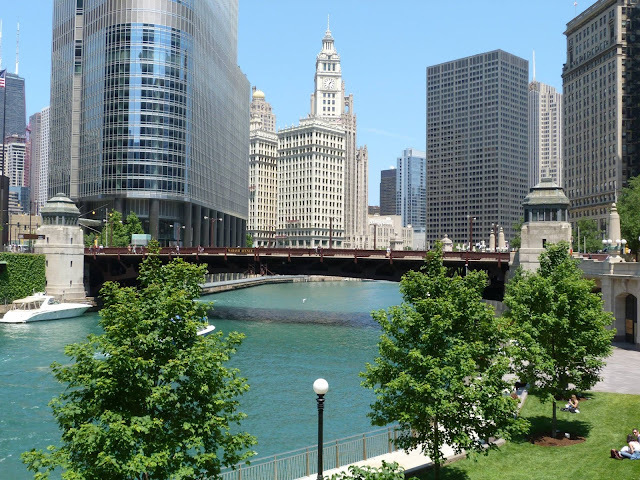 As a result the bridge was placed diagonally to Wabash Avenue, complicating the planning for the structure. This is the first bridge ever to be built at this location. It helped to relieve the traffic burden placed on Michigan Avenue, connecting Wabash Avenue south of the river to Cass Street on the north side Today Cass Street is called Wabash Avenue as well.